Roberto Rossellini's first box-office success after a string of commercial failures was also a return to the themes of the films which brought him international fame, Rome, Open City and his other neorealist classics. Based on an article by the Italian journalist Indro Montanelli, Il Generale Della Rovere (1959) stars Vittorio De Sica as confidence trickster Emanuele Bardone who helps to save Italians arrested by the Gestapo, or at least pretends to do so, in exchange for money or gifts from their family. When he attempts to save a man already executed he is turned over by the man's wife and is given the choice of execution or carrying out a confidence trick for the Germans; to assume the identity of General Della Rovere. Turning on his country to save his skin Bardone enters prison to seek out the identity of the partisan commander, Fabrizio. 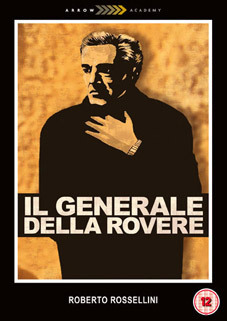 Il Generale Della Rovere will be released on UK DVD on 4th July by Arrow Films as part of the Arrow Academy series at the RRP of £19.99. Comprehensive booklet featuring writing by Tag Gallagher (The Adventures of Roberto Rossellini: His Life and Films) and Peter Bondanella (The Films of Roberto Rossellini) as well a contemporary interview with director Roberto Rossellini.